WEDDING GUEST BOOK WITH 15 BLANK SHEETS FOR PHOTOS AND MESSAGES! Do you want to remember all the warm memories from your big day and turn them into something that you can cherish for years? Worry no more! Our wedding guest book with blank pages is the perfect one for you! This magnificent blank guest registry book will definitely make your special day become completely unforgettable with its 15 blank sheets (for photos and messages) that your guests have to sign or answer your own pre-written questions-or even share their fun stories about you! WHY CHOOSE OUR WEDDING GUEST BOOK? ✅ Perfect registry guest book for a variety of occasion such as wedding, engagement, graduation, birthday, anniversary party and baby shower, etc. You won't find these features anywhere! So, if I were you I'll definitely stock up on this wedding guest book to make sure all my special events are documented and I can recall the fun time I had with my guests anytime! STOCKS ARE LIMITED. SO, HURRY! GET YOURS NOW! Click the "Add to Cart" button up there to ensure a slot! PLENTY OF PAGES. 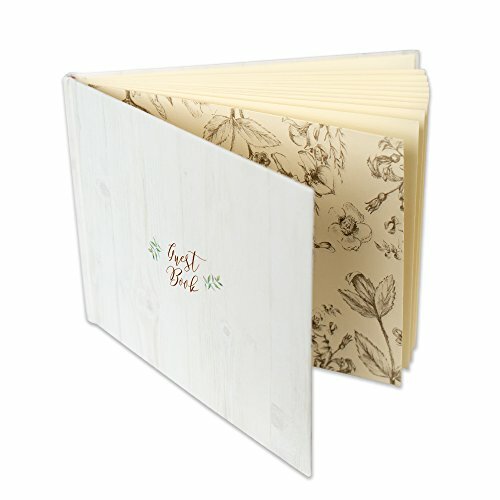 Our 7.79" x 10.08" wedding guest book includes 15 blank sheets for photos and messages. BUILT TO LAST. Comes in a hardcover binding so you can cherish your memories for more than years. FOR ANY OCCASIONS. With its simple and unique wood grain design our wedding guest sign in book will fit in a variety of occasions like graduation, birthday, baby shower, engagement and more! PERFECT GIFT. Will satisfy your friend or family member who has the spirit of Leonardo Da Vinci and Pablo Picasso when it comes to artistry. VARIETY OF USAGE. Can be used as an alternative bridal guest book sign in and as keepsakes of guests for an engagement or wedding party. Also perfect for a DIY polaroid guest book wedding theme. If you have any questions about this product by Customoffi, contact us by completing and submitting the form below. If you are looking for a specif part number, please include it with your message.